Hi, I’m Stu Harrison and we’re here at the Merriam Pianos Oakville showroom just outside of Toronto, Canada. And today I am looking at the Kawai GL-10 baby grand piano, and there’re a couple things that we’re going to be talking about. We’re going to be comparing it to the GM-10K which was its immediate predecessor. 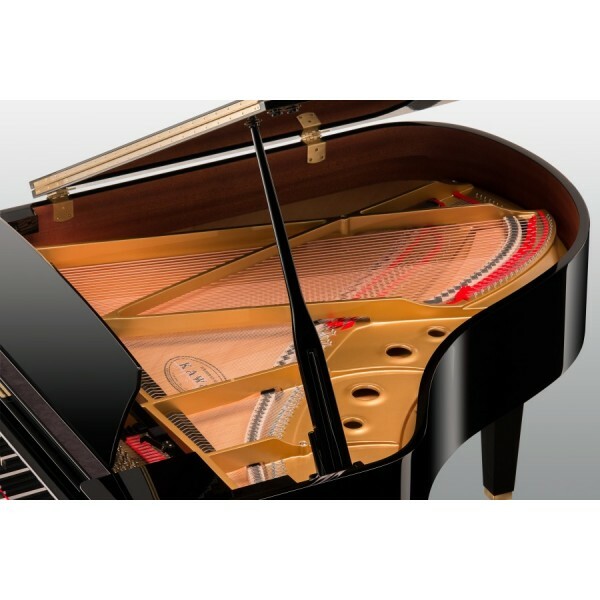 There’s a lot of information on the market about the GM-10K, it was one of the best selling baby grand pianos in the country for probably close to a decade, and so people are familiar with it. But we have been getting a lot of questions about how it’s different than the GL-10. Did they just rename it? Is it essentially just a re-brand? So I’m going to cover that.We’re going to look specifically, exactly how those two instruments are different. But more importantly, and more fun, I’m also going to give this thing a real test drive. We’re going to do a little bit of playing a bit later on in the review, and give you a chance at home to listen to it. We’re going to mic it up really nicely, so you have the chance to get a taste. And then of course anytime you feel like coming down to any one of our showrooms we’ve got GL-10’s ready to give a play. So, we’re gonna get started. First of all, let’s talk about the differences between the GL-10 and the GM-10. I’m set up right beside a GM-10 behind me, so we can actually physically see what those differences are as we’re talking about them. The first difference between the GL-10 and the GM-10 that I’m going to discuss is the action. Now, one of the things that always differentiated the GM-10K from the rest of the quiet line was that since the early 2000s the GM-10 was the only grand piano that Kawai was making for the Canadian Market that did not have the millennium three action. Of course, the millennium three action is Kawai’s rather widely acclaimed carbon fiber action. Fantastically light, very, very precise and they had their previous generation on the GM-10, the AVS action, but they had reserved their best action for one above the GM 10. So the first thing that’s obvious about the GL-10 and the GM-10 is that the action is a little more fluid, the repetition speed has actually come up a little bit, which advanced players are going to really like. And you can definitely tell that the accuracy, particularly at lower dynamic ranges, has improved. So right off the bat, the touch between the two pianos, you can really sense the difference as soon as you start to play. Along with the upgrade to the millennium 3 action series that the GL-10 Series has received, one other thing that the GL-10 has also had updated is something that the entire GL line has had developed by Kawai which is extended keys. Now when I say this to people they automatically start thinking that I’m talking about the white part of the key that they see and they play on and is somehow bigger. Definitely not the case, the playable surface of the key has not changed at all. So what they’re actually referring to is the lever behind this. I’m just going to take this off so we can actually have a quick peek so you know exactly what I’m talking about. 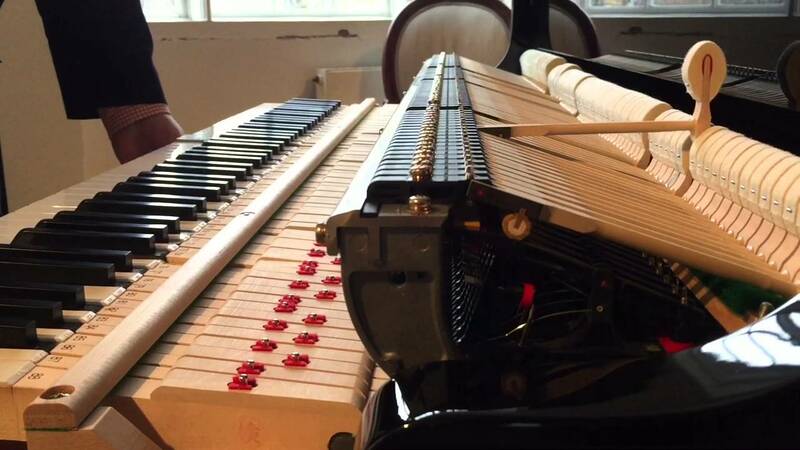 Now any piano key, just like any lever, gets more accurate and more powerful the longer that the key gets. And so one of the things that people really notice when they play a nine foot piano versus a five foot piano is the touch is so much different. But nobody really ever talks about why that is. One of the biggest reasons is the length of the key on a nine foot is substantially longer than what you would ever get on a baby grand. So what they’ve done on the GL-10 is the length from the front of the key to the series of pins which they call the balance rail has been extended by about three-quarters of an inch, and then the distance from the balance rail back to what they call the cap stand which is where it comes in contact with the rest of the action, has also been extended by about a third of an inch. So in total, the entire key assembly on a GL-10 is more than an inch longer than the GM-10, that immediately has an effect on the power that you can command out of the instrument but also the repetition speed, and how accurately you can play, and particularly softly. So the combination of an extended key as well as a move to the full millennium three quite frankly means that the GL-10 now has a completely professional totally top-of-the-line feel but still at a very, very affordable nicely sized baby grand piano. Another difference between the GM-10K and the GL-10 is this, the GM-10 was never equipped with a soft-fall close system. The GL-10, of course, has received that, so for young families with children apt to be pulling down on things, this is probably going to save a few pinched fingers, which is always a good thing. The last technical difference I’m going to touch on between the GL-10 and the GM-10 is how they construct the soundboard. Both the GM and the GL-10 always had solid spruce soundboards, which for the price range was somewhat unique. They’re not the only instruments in the 10, 11, 12,000 dollar range that have solid spruce, but it certainly isn’t something you should take for granted in the market. Many pianos at this price point have what they call surface tension or laminated soundboards. It may improve stability, but it certainly does not improve the sound. Solid spruce generally speaking on all pianos is always going to give you a clear, better sustained, and a much more complex tone. So here’s what’s different with the GL-10 soundboard versus the GM-10. The GL-10 is now receiving a tapered soundboard, so what that means is as the soundboard gets closer to the edge of the rim of the piano it gets narrower. Now this does a couple of things, as the energy or as the tension of the soundboard increases, or the rigidity of the soundboard increases the closer it gets to the edge, by thinning it you actually increase the usable area of the soundboard. Otherwise, if it would remain the same thickness right to the edge, as it gets more rigid you just have less of the soundboard that’s going to be actually vibrating. So by tapering it, you increase the surface area that’s actually usable. But the second thing it does is it also virtually guarantees that over time the crown of the soundboard is never going to be completely flat. Because of course if it’s physically shaped that way you’re never going to wind up with the same sort of distortion and standing waves that a flattened non-tapered soundboard would receive. I know it’s a little bit technical, but believe me, in the long run, investing in a piano with a tapered soundboard is going to preserve a great sound far longer into the future than one without. So now we’re going to listen to the GL-10, now keep in mind this is a five foot piano, and we’re recording it with a zoomed H-4N recording device placed right in the middle of the piano, two little stereo condenser microphones that are the only mic we’ve got on it, and it’s just the straight sound, no editing, and that’s what you’re going to be hearing at home. So as close to what we can be hearing here, is exactly what we’re going to be giving you, so let’s give this a try. For baby grands, that’s pretty amazing sound in terms of the depth of the tone, the complexity, and the sound it’s sustaining. When you look at the price range that this piano is in which is well under $20,000, it usually sits in the low teens depending on the market, the value of this is absolutely extraordinary, so I hope you have a chance to come into one of Merriam’s showrooms. Try the GL-10, it’s Kawai’s brand new update as we’ve said before. Thanks so much for listening, I’m Stu Harrison, again with Merriam Pianos. What a wonderful idea for #WineWednesday — a piano bar! PARIS, Texas — A $40,000 Bergmann baby grand piano that belonged to the Paris Community Theatre vanished over the weekend. Now, police are trying to figure out why and how somebody stole it. Brian King could play the upright piano in his Carlingwood-area home. But he prefers the baby grand at city hall so much more that he makes the trek downtown almost every day. Millionaire lawyer Richard Fields has won the latest round of his £6million High Court divorce battle with his former beauty queen wife Ekaterina Parfenova – who gets custody of his Steinway baby grand piano. The 59-year-old was desperate to hold on to the £64,000 piano because he previously lost one in a divorce settlement with his third wife. 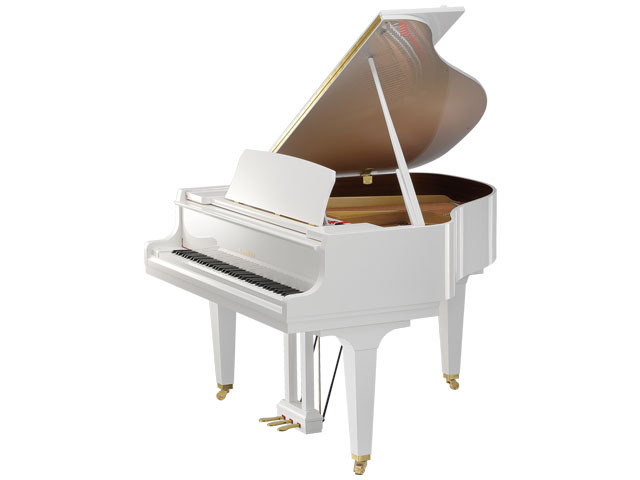 This entry was posted in Merriam Pianos, Pianos, Kawai, Piano Reviews and tagged baby grand, baby grand pianos, Kawai GL-10, Kawai GL-10 baby grand piano.